In the search for the elusive and perhaps none existent Dr Y, the lovely Renee stumbled upon Dr. Radical. It was hard to contain our excitement. The moment we were in our car we cracked a can open and took a big, acidic chug of room temperature Dr. Radical. Yuck. 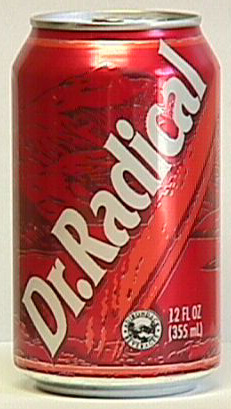 Refrigerating Dr. Radical made it palatable, but it was still pretty bad. 4 was settled upon as an accurate score, but depending on future scores of other drinks it may be lowered further.